The Rune Poems are three poems that list the letters of runic alphabets while providing an explanatory poetic stanza for each letter. 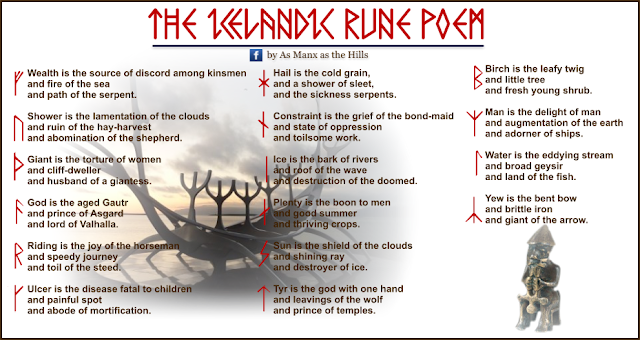 Three different poems have been preserved: the Anglo-Saxon Rune Poem, the Norwegian Rune Poem, and the Icelandic Rune Poem. The Icelandic and Norwegian poems list 16 Younger Futhark runes, while the Anglo Saxon Rune Poem lists 26 Anglo-Saxon runes. Each poem differs in poetic verse, but they contain numerous parallels between one another. Further, the poems provide references to figures from Norse paganism and Anglo-Saxon paganism, the latter included alongside Christian references.